It’s easy, join now online! Once you’ve ordered your membership online, you can use your benefits straight away. We will send you an email confirmation with your membership number and virtual membership card. When purchasing or renewing your membership you will be asked to choose whether you want a plastic card and luggage tag in addition to your virtual membership card. If you’re opted in for autorenewal, we will automatically send you a virtual membership card at your next renewal date unless you change your preferences via the member section of the easyJet Plus website at least 5 days before your current expiry date. If you choose virtual membership and change your mind later you can order a plastic card & luggage tag at any time via the Member section of the easyJet Plus website. If you have any problems using your virtual card please contact easyJet Customer Services. If you have ordered a plastic membership card & luggage tags these will usually be with you between one and three weeks. You can use your membership and still benefit from easyJet Plus whilst your card is being delivered. If you have ordered a plastic card and not received this within 30 days please contact our Customer Service Team. On the 1st April 2019 easyJet Plus will be reducing its carbon footprint and going digital! When you purchase or renew a membership, you will automatically be sent a virtual card to download to your Apple Wallet or Google Pay app. With a virtual card you can redeem your benefits in exactly the same way as the previous plastic cards, but they are easier & more convenient to carry and can be sent to you instantly, instead of having to wait 21 days for a plastic card delivery. If you would still like a plastic card & luggage tag, you can purchase this for a small fee via plus.easyjet.com. If your membership was activated after the 22nd January 2019 you should have received a virtual card in your Welcome email. Currently virtual cards are not available for memberships that began before this date. Please use your easyJet Plus membership number which you can find on your confirmation email or your virtual or plastic easyJet Plus card and enter it when booking your flight online. Choose your seat and continue with your booking as normal until you get to the Passenger Details screen. You’ll be asked for your easyJet Plus membership number here, and your basket will be credited with the cost of your seat. The Fast Track security symbol will be added to your boarding pass automatically if the airport you are flying from is part of the programme. The code 'SB' will also be added so that you may use Speedy Boarding. Show your mobile or printed Boarding Pass to join the easyJet Plus Speedy Boarding queue at the gate. 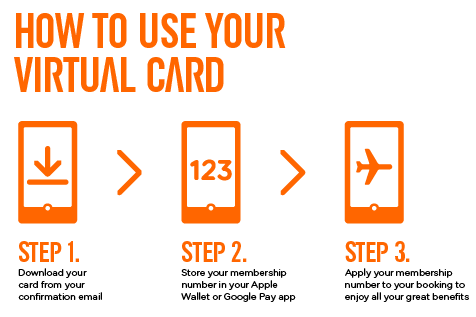 If you have entered your easyJet Plus details when booking, you don’t need to show your card at the airport. If you are flying in the near future and are unable to add your membership number to your booking, please show your virtual or plastic card at the gate together with your passport to benefit from easyJet Plus Speedy Boarding. Please note that you must add your membership number to your booking to use Fast Track Security – it is not enough to show your easyJet Plus card at security. Your easyJet Plus membership is personal to you and so are the benefits. 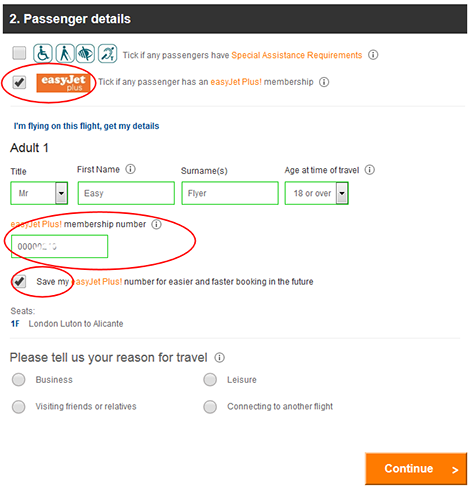 You can add non-members to your easyJet flight booking but they won't be able to enjoy your membership benefits. If you’d like your partner to be able to enjoy membership benefits, you can buy a Partner Card at a discounted rate on plus.easyJet.com. Children over the age of 2 need to have their own easyJet Plus card to be able to use membership benefits. You can buy a discounted Child Card for children between 2 and 17 years of age on plus.easyJet.com. You can edit or update your details by going to the ‘Manage my account’ section on the easyJet Plus website. The surname on your card must match your passport as this will be used to verify your identity when booking flights. If the names do not match then your membership ID may be rejected. If you need to change you card details you can do so by going to the ‘Manage my account’ section on the easyJet Plus website. This might take up to 24 hours to update. For any other changes or if there is still an issue with your membership, please contact the easyJet Customer Service Team. If you lose your plastic card or baggage tags, don’t worry, you can order a replacement on the ‘Manage my account’ section on the easyJet Plus website. Replacement cards cost £15 / €21 / CHF 32 each. If you have requested a password reset email and have not yet received this please check your spam box. You may need to add easyjetplus@plus.easyjet.com to your email safe senders list. In order to request a new password you will need to input your membership number. If your password reset email is not in your spam box, please contact our Customer Service Team. Choose your seat and continue with your booking as normal until you get to the Passenger Details screen. You’ll be asked for your easyJet Plus membership number and your basket will be credited with the cost of your seat. You can also select a seat after booking through My easyJet using your login email address and password, or whilst you are 'Check-in'. If there is more than one easyJet Plus cardholder on a booking, the system will allow you to enter all of the easyJet Plus card numbers for each person on the booking. If you’re bringing hold luggage to the airport, look out for the dedicated easyJet Plus desks when you arrive. Bag Drop desk closure and gate closure times can vary. Check your flight confirmation email and your online boarding pass for specific details. If you boarding pass doesn’t show the Fast Track symbol, this could mean that Fast Track security is not available at that airport or you may not have included your easyJet Plus membership number with your booking. Once you are at the airport Follow the signs to Fast Track security and show the security agent your boarding pass to enter. If the Fast Track security gate is an automated system, you can scan your boarding pass barcode to enter. Please note that you must add your membership number to your booking to use Fast Track Security – it is not enough to show your easyJet Plus card at security. To be amongst the first to board, join the easyJet Plus Speedy Boarding queue at the departure gate. Your boarding pass will show the Speedy Boarding symbol (SB) which should be shown to the Ground Crew. If you have not entered your easyJet Plus card number during booking, you can still benefit from Speedy Boarding by showing your virtual or plastic easyJet Plus membership card. You can bring one cabin bag with a maximum size of 56x45x25cm including handles and wheels. In addition you can bring one small bag (handbag/laptop bag) maximum size of 45 x 36 x 20cm which must be placed under the seat in front. Overhead locker space is limited so please use easyJet Plus Speedy Boarding in order to secure your space. If after booking a flight on easyjet.com, you find the same flight on easyjet.com at a lower price (when taken together with all applicable fees and charges), you will be refunded the difference as a credit voucher against future flights on easyJet. The only exception to this “price promise” is if the lower fares have been offered as part of a promotional offer that is launched after you have purchased the Flight. To qualify for a refund, the lower fare must be for the same date, destination and Flight number as in the Booking made and must still be available for sale at the time your claim is made to our Customer Service Team.See Article 25 of the easyJet Terms and Conditions for more details. Your EasyJet Plus subscription will automatically renew unless you opted out and chose to manually renew your membership every 12 months. With automatic renewal there is nothing for you to do. Payment will be deducted from the credit or debit card you used when joining EasyJet Plus. If your card details are out of date your renewal will fail and you’ll need to manually renew your membership. Go to the EasyJet Plus website. Click on ‘Member login’ on the top right hand corner of the page. Enter your login details and password and then click on ‘Renew Membership’. There is a 14 day cooling off period from the date of purchase where you will be able to cancel your membership. If you wish to cancel your card and get a full refund go to the ‘Manage my account’ section on the easyJet Plus website. If you are unable to access the website you can email or call our Customer Service Team. easyJet Plus membership is an on-going subscription and will be renewed automatically on the day following the last day of your membership year (a membership year is 12 months from the date you received your easyJet Plus membership ID number).We will send you an email notification 40 days prior to expiry of your membership. You will be able to opt out of your upcoming auto renewal online by going to the ‘Manage my account’ section of the easyJet Plus website at least 5 days prior to the renewal of your membership. Upon your auto renewal you will also have a 14 day cooling off period where you will be able to cancel your membership and have a full refund by going to the ‘Manage my account’ section on the easyJet Plus website. If you are unable to access the website you can email or call our Customer Service Team. After the 14 days cooling off period from the date of initial purchase or from the date of auto renewal, you will not be able to claim a full or partial refund of your membership, except as outlined in the Membership Terms and Conditions. Your welcome email contains a receipt / confirmation of payment. No VAT is charged on easyJet plus memberships. If you’ve lost your welcome email, you can contact our Customer Service Team and request for it to be resent. Occasionally we may need to contact you by email for administrative or operational reasons, for example in order to allow you to reset your password or to send you confirmation or advance notice of your payments. Please be aware that these communications are not made for marketing purposes and as such, you will continue to receive them even if you choose to not receive marketing communications.